On Wednesday, legendary surfer Kelly Slater appeared to win a record 11th Association of Surfing Professionals world championship at the Rip Curl Pro Search at Ocean Beach in San Francisco. As the LA Times puts it, "in 1992, Kelly Slater became the youngest surfer to win a world championship. In 2011, the 39-year-old surfing legend became the oldest surfer to win one." Today, the ASP released a statement announcing that a calculation error led the organization to crown Slater the champ before he'd actually won, and laying out scenarios under which Slater can still take the crown. The ASP (Association of Surfing Professionals) announced it had made a miscalculation and that Kelly Slater, although he did in fact win his heat on Wednesday, did not tally enough total points over the course of this year to officially clinch his world title. So he's not yet the world champ; he still needs to win one more heat. The contest started with 36 surfers and is now down to 12. Slater still has two more heats he gets to surf in, guaranteed. It still looks extremely likely that he will become world champ. But the question is will he do it in San Francisco or will he do it at Pipeline, in Hawaii. Rip Curl Pro search changes locations each year. In the past it's been in Mexico and Portugal. It's never been here before. There are 11 events throughout the year, and they tally up all your points based on how you did at those events. If you hit a magic number, you become the world champ. Right now there's an Australian guy named Owen Wright who's in 2nd place and is pretty far behind Kelly. In order for Kelly to not win, Owen Wright needs to take 1st place in SF and also 1st place at the next event at Pipeline in Hawaii, in about a month. And Kelly Slater would need to lose everything he surfs from here on out. The possibility of all that happening is really slim. Kelly Slater is already a 10-time world champion. The closest surfer behind him has won four world championships and a couple of guys have won three. It further cements how incredibly dominant he is. Not to mention the fact that he's 39 years old. For the same guy to keep doing it over and over again over a 20-year span is really exceptional. 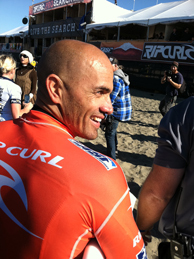 It was really cool to be at the beach and see San Francsico support Kelly Slater. It's so novel to have a high-caliber surf competition at Ocean Beach in the first place, and then to have the opportunity for Kelly Slater to make history there was even more exceptional. It would be kind of a bummer if it turns out this whole thing was mistaken and he loses two heats and has to go win in Hawaii. That would be a real loss, because there was something really cool about him winning on our beach here in the city. Read Mark Lukach's Rip Curl recaps at the Ocean Beach Bulletin. The ASP has admitted that, due to a calculation error within its rankings’ system, the 2011 ASP World Title has yet to be officially decided and that Kelly Slater (USA), 39, was prematurely awarded his 11th ASP World Title on Wednesday. Event organizers will reconvene tomorrow morning at 7:30am to assess conditions for a possible 8am start. Surfline, official forecasters for the Rip Curl Pro Search San Francisco, are calling New NW swell will build through the day on Friday and be strongest in the afternoon, with solidly overhead surf. Those waves fade throughout Saturday, although the morning will still be fairly solid. Our next swell will move in over Sunday afternoon and will be strongest Monday and will be a little smaller than the Friday afternoon swell. Variable onshore wind will prevail over the next few days, although there will be periods of light wind and relatively clean conditions.